Gluten Free Teriyaki Sauce is one of the easiest things to make. No need to buy the bottled stuff when you can make it fresh at home. 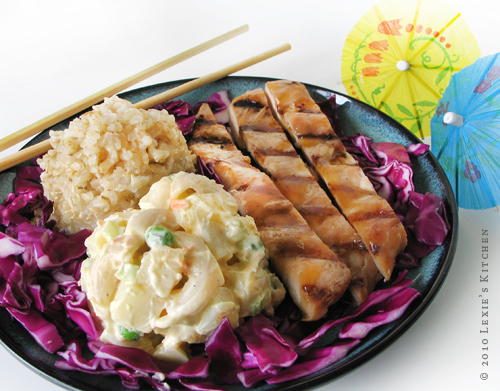 Teriyaki marinade is one of the easiest things to make. No need to buy the bottled stuff when you can make it fresh, at home, with as little as three ingredients. Use on chicken, beef or fish. When marinating fish, reduce marinating time to 30-60 minutes. Remove chicken from fridge, discard used marinade and transfer chicken to an empty cereal bag or 1-gallon Ziploc freezer bag. Partially seal/fold edge of bag under to contain meat. Place on cutting board and tenderize/pound out with meat tenderizing mallet until 1/4-1/2 inch thick. Drizzle some OLIVE OIL on the chicken and brush some oil on grill. Grill over medium heat until cooked through, flipping once. Serve on a thick bed of shredded green cabbage (I used red because it’s what I had on hand) with a scoop of brown rice and a scoop of Gluten-Free Hawaiian-Style Potato Mac Salad. NOTES: For a teriyaki dipping sauce, double the marinade and reserve half of it. Bring reserved liquid to rapid boil in a small saucepan. Whisk in a slurry of 1/4 cup WATER and 1-1/2 teaspoons ARROWROOT STARCH. Return to a rapid boil for 15 seconds and remove from heat. Never re-use the marinade the chicken soaked in. Be sure to sanitize the cutting board that the chicken was pounded on, the tenderizing mallet and the counter. We’re both GF and soy free, so this one is out for us. Both soy sauce and Bragg’s Liquid Aminos are soy products. This does look like a tasty and useful marinade though! Hi Erica, I am sorry. I did forget to "note" that soy was an ingredient in this recipe. It is tasty, and I am sorry it’s off limits for ya! I don’t use soy very often, so don’t give up on Lexie’s Kitchen 🙂 The times I use it, it’s usually in the form of liquid aminos or gf soy sauce. I looove tofu and would looove to post a chocolate tofu mousse pie recipe. Maybe I will, I’ll just will wrap it in CAUTION tape 🙂 Ha! Thanks for taking the time to comment. I really appreciate it. Hi I wanted to inform you and your soy free readers there is a soy free soy sauce made from coconuts called coconut secret. I have included a link so you can check it out yourself, you can also get this product along with their other products at certain health food stores. Good luck! I am more than willing to help you and anyone out as I know how hard and frustrating it is to leave behind certain foods when you suffer from food allergies. I have tasted and used the coconut soy sauce and it tastes like the real thing it's uncanny. I haven't gotten a chance to try the teriyaki chicken yet but am planning on cooking it this week-end, everything on your blog looks delicious and I am glad to have found it as I suffer from Rheumatoid arthritis and have a very limiting diet because certain foods cause flares for me. Anyway, I hope you get a chance to try the sauce. Thanks so much for the great recipe! My 5 year old LOVES the sauce. She calls it "the yummy sauce" and asks for it all the time. I love this recipe because it's so easy and so delicious. This recipe is a new discovery for me as it was linked to a recent post. And man, am I glad it was! It looks delicious – I'll be trying it in the next week or so. Thanks for sharing it!